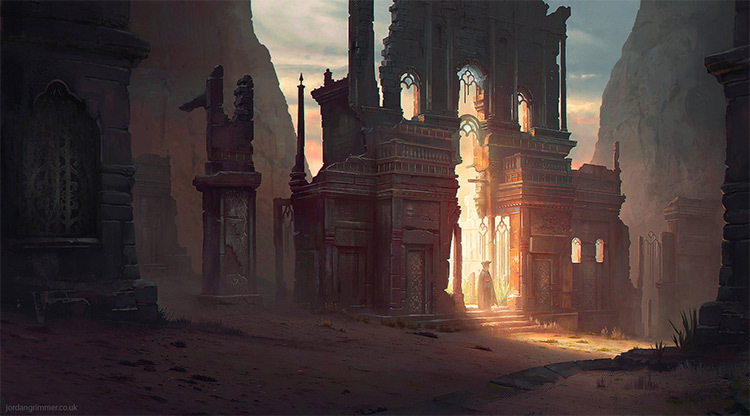 The 25-years-young concept artist Jordan Grimmer is hardly a household name. Yet he has a portfolio in his mid-twenties that proves to be both technically skilled and creatively fascinating. 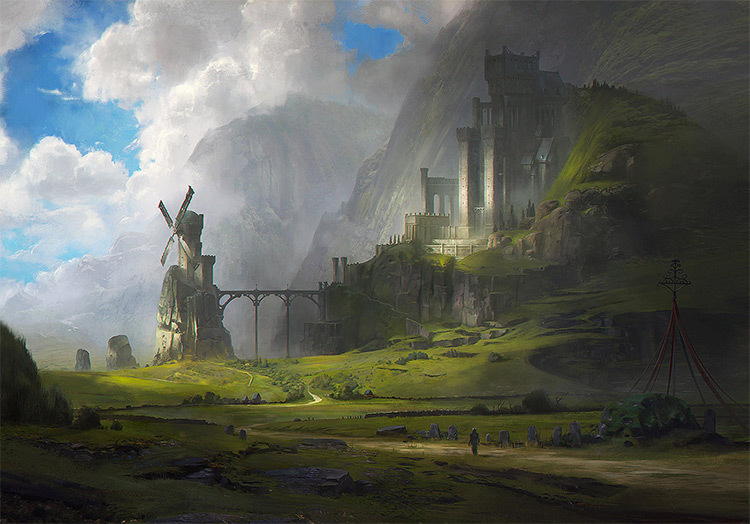 His environment concept art caught my attention instantly. This interview covers Jordan’s trajectory as an artist, along with his quick introduction to the field of game art. He also shares opinions and his suggestions for how new artists can most efficiently practice to achieve the best results. 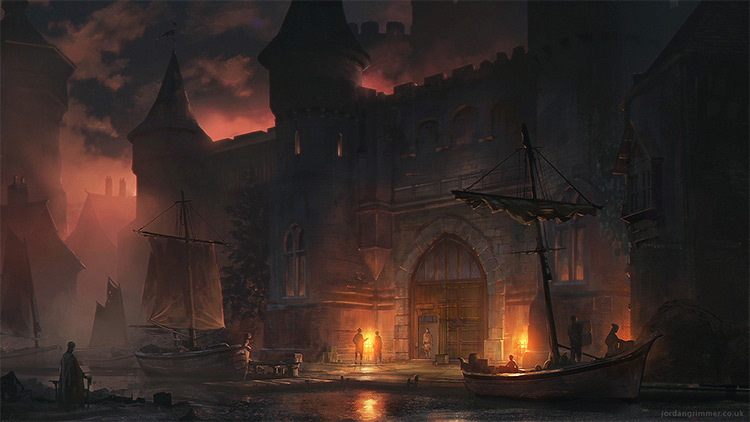 If you’d like to see his work, Jordan frequently publishes on various communities like DeviantArt and ArtStation. 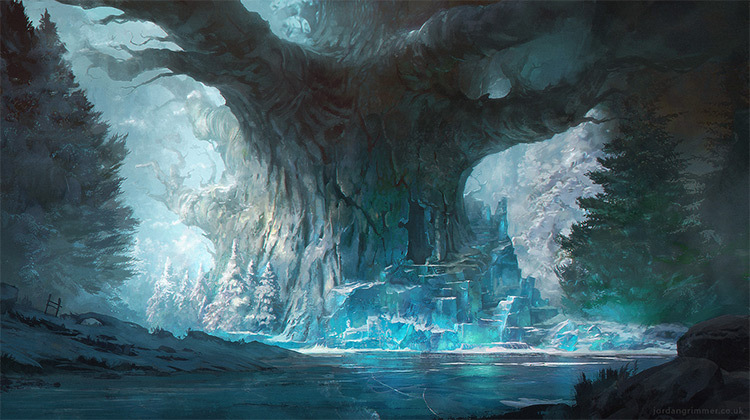 Most of his game art captures landscapes & environments but he can produce a variety of great designs. And to me it’s clear he’ll keep pushing high-quality artwork for many years to come. Can you share a little about yourself and how you got into art? At what point in life did you seriously consider art as a career? I’m currently 25 and I’ve been producing art professionally for about 5 years now. I started learning around 2008 when I joined a video games art university course. 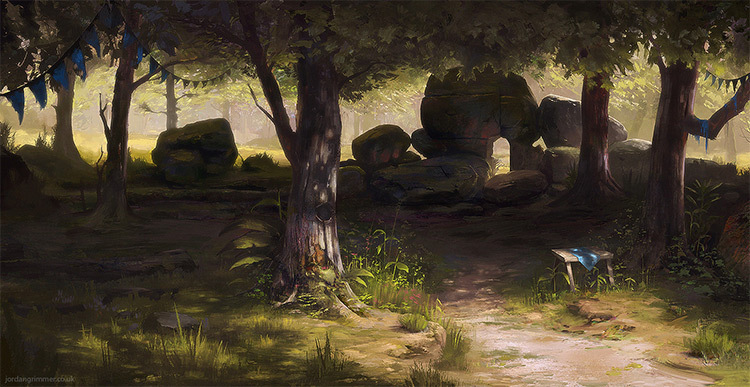 From there I found my love of painting environments and then a passion for concept art in general. It wasn’t until after I left university that I really started to think that I could make money from being a concept artist. Once I got a few freelance gigs I knew it was something I should carry on doing. Is it possible to explain your progress as an artist? Was there a moment when you finally realized you had achieved a professional skill level? I think the main reason I’ve been able to progress is because of my parents and the patience had with me. They allowed me the time to sit up in my room and paint and never forced me to take any old job that I didn’t want to do. It’s something I really appreciate. The time I had at university was a great help because it also let me get on with learning and painting. The more I paint the more I learn, that’s all I’ve done really. You have to find that one thing you always get excited about painting and just do that as much as possible—especially when you’re starting out. It has to be fun. If not you just won’t enjoy yourself. I think it’s a healthy thing to look over your past work because it helps you see what you should improve on, while also giving you a nice boost of self-esteem. Whenever I’m in a rut I go and look through all my stuff from the beginning of when I started digital painting. It definitely helps me see times that I took a step up from a previous piece where I might have learned a technique that would affect work in the future. For me it’s quite hard to really feel improvement until I’ve stepped back and taken stock over what I’ve done. From that I honestly can’t pinpoint a specific piece or time when I knew I had attained a professional level. Realistically I would say it’s only in the last year that my work has reached a stage that I would call “professional”. Are there any specific resources, books, teachers, or techniques that dramatically improved your quality of practice? James Gurney’s Color and Light book was a real help for me. I also used to watch a lot of online tutorials from people like James Paick and Feng Zhu. There are a lot of resources out there and online. Most of them are free too, especially on YouTube. Most recently Eytan Zana and Shaddy Safadi’s tutorials have been a big help in changing the way I start and build my paintings, concentrating more on shape and composition before rushing into the details. Can you share a little about your first paid gig? Were there any mistakes you made as a beginner that you could share to help other aspiring artists? on anyone else. It was a great feeling but I definitely priced myself a bit low. If I had any advice for artists starting out in freelance it would be to do your research on how much to charge. It is difficult to find out a rate that suits what you can offer, but it’s really important to not sell yourself short. Doing so makes clients believe that concept work should be cheap, undervaluing the hundreds of hours of practice and training that goes into creating the pieces you make. If you feel like you’re ready to work as a professional freelancer, charge professional prices. If you’re putting in a hefty amount of hours into something where you’re getting paid peanuts(or nothing at all!) it’s probably not right. Promises of exposure instead of cash will never be a fair payment. How did you find Kobojo and what was your interview process like for getting hired? Funnily enough I began working at Kobojo because the art manager contacted me through DeviantArt. I got a random message one afternoon and at first I thought it was a scam. I replied anyway and we scheduled a Skype chat where we spoke about the project they were working on and how they wanted someone who could do environment artwork for the game they were developing. I went up to Scotland for an informal interview. After that I got the position and moved up two weeks later. The process was a little surreal. I was really hoping and looking for a studio job for a long time before I started there. I had been to quite a few interviews where I left knowing that I hadn’t got it there and then. It was very disheartening. It just goes to show that you never know who might be looking at your work and what opportunities could come of it. I’ve just recently started working at Lionhead Studios and for that I took a more conventional approach of applying for the job and having an interview again over Skype. Can you share details about a typical workday at Kobojo? Who do you work with, what sort of tasks are you given, and how do you fit into the creative pipeline? My days at Kobojo usually consisted of me conceptualizing and painting assets and props that would then be used in the game. The game we made(Zodiac: Orcanon Odyssey) using my painted assets for the environments and characters, so it’s pretty cool to think the stuff I made would be seen directly in-game. The pipeline process works with the design team giving us a rundown of what they wanted to see in the levels, which we would then plan and conceptualize ideas. Eventually we would refine these concepts into usable assets and then use Unity to place them in the game environments. Being able to have that experience with Unity was a good plus to the job. Sometimes the art team would work with the design and development teams, mostly to discuss the types of tools we might need to complete our tasks. Since it was quite a small studio it allowed me to gather insight into the workings of a studio as a whole, even if it was just picking up what certain words meant(listening to coders talk is very confusing). Your portfolio features mostly environment concepts. Is there something that draws you to environments over anything else? I think the process of drawing and sketching characters was something I found more daunting at the time, so I clung to environments instead. With characters I personally feel there’s a smaller margin of error. When something looks off it’s much more apparent. With environments you could create a huge sense of scale simply by putting a tiny man somewhere in a mess of brush strokes and it would look cool. That’s something I did a lot when I first started messing around in Photoshop. Now I love making environments because you can tell a story with them. You can lead people into a little world you’ve made for yourself and I think that’s amazing. It’s pretty addictive. Aside from concept art you also do illustrations and book/album covers. Do you have a favorite type of project or favorite medium for creating artwork? I love painting album covers. I love the idea of my work being used to illustrate something musical. If I ever gave up art I would try to do something musical and I’d paint rubbish album covers for myself. Do you think age factors into the discussion of when someone could pursue concept art? It seems most pros have been drawing since they were kids. But could someone start in their 30s or even 40s and still achieve some level of success? Definitely. I think it all depends on how much effort and time you want to put in. It shouldn’t matter how old you are. I used to doodle when I was a child but I didn’t start learning properly until I was 18. You just have to put in that time and practice. Also try to focus on the things you think you need to work on the most(for example composition, lighting, or color). People often ask how long it takes to attain professional skills, especially to achieve your level of skill. How would you answer that question for someone just starting to learn? As I mentioned, it all depends on the time and practice you put in. It’s completely dependent on how quickly you learn the principles. To answer that question I would say not to worry about getting good. Just focus on where you are right now and look into what you can do to push yourself to your next level. Drawing from life is undoubtedly essential. But concept art is often constructed from imagination and reference. How much do you suggest someone practice life drawing vs imaginative drawing, and how do these techniques factor into professional concept artwork? I think it’s a good idea to balance the amount of time you do for both, as they both have their advantages. But essentially, life drawing should help reinforce your imaginative doodles. One of the things I wish I had done when I was learning was to spend more time referencing and studying the things from life that I was trying to incorporate into my paintings. It’s a good idea to focus on what you think is important for your development at the time. Then have a try at implementing what you’ve absorbed into your work. But at the same time, if I hadn’t spent my time doodling without much direction I probably wouldn’t have come up with some of the ideas I’ve produced. It’s about striking a balance between keeping the ideas fluid and using what you’ve learned from studying to make those ideas work. Between working freelance and working for a studio, which lifestyle do you prefer and why? To me there are perks to both of them. I like being able to paint in my free time in my room because I have the independence to work at my own schedule. Though I have definitely found this to be isolating, and it can get to you if you don’t push yourself to socialize outside of your bubble. Working in a studio doesn’t have that problem because there are always people around. I love that. I’ve learned so much more having an immediate point of contact with people for feedback and development. You make some great friends along the way, too. Based on that I probably prefer studio work. But without the freelance step it wouldn’t have been possible for me. Could you offer any parting advice for aspiring concept artists or aspiring artists in general? I feel it’s really important to be proud of what you’ve accomplished in art regardless of what level you think you’re at. When you’re starting out it doesn’t really matter as long as you’re realistic about where your skills are and where you can improve. It definitely takes time to learn something like painting and it’s easy to get disappointed when you think you haven’t improved. Give it a few months. Keep at it as much as you can and look over your past work. If you’re putting in effort I’m sure there will be some kind of improvement. Thanks to Jordan for his consideration and time spent on this post. He has a wonderful base of knowledge and offers some really valuable points for upcoming concept artists. 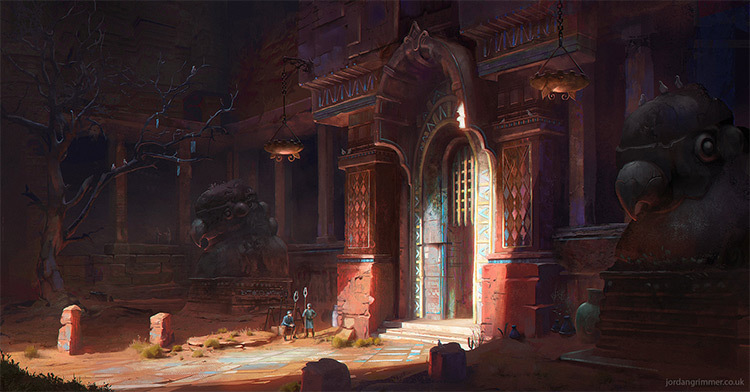 To see more of Jordan’s work check out his personal website or visit his ArtStation portfolio. 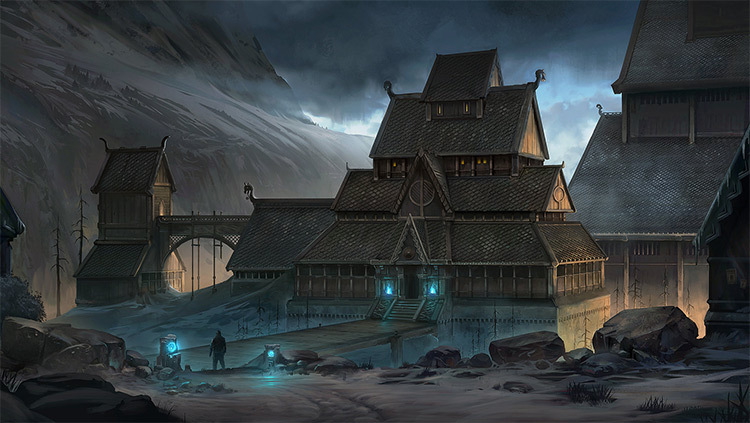 He also updates on Twitter where you can follow him @jordan_grimmer.